A convicted steroid dealer has completed his sentence for selling anabolic steroids back in December 2013. Joshua Hines, from Magnolia, was first arrested in December 2013 for his part in an anabolic steroid and human growth hormone (HGH) distributing network. El Drado Police and the officers form the Magnolia Police Department first begun to investigate an underground lab (UGL) and raw steroid powder importation operation in 2013. The steroid package was intercepted by Homeland Security agents in San Francisco and, like many illegal packages being imported into the United States, wasn’t confiscated, but undercover officers made a “controlled delivery” setting up the receipt of the pack of banned substances. Investigators intercepted a 411g package of raw testosterone shipped from China to Hines business Extreme Fitness Center in North Dudley. 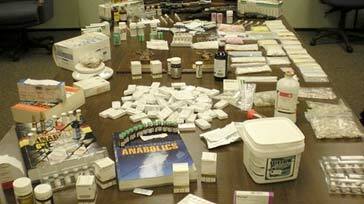 Also seized were 8,000 units of oral and injectable steroid dosages, vials, pills and tablets. 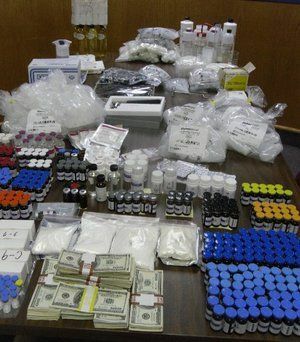 At the time, this was the largest steroid seizure in Arkansas history. Computer records were also discovered with 35 firearms, ammunition, silencers, scopes, 4 vehicles and $45,000 in cash. Hines was one of four arrested and imprisoned for their role in the UGL. Robert Andrew “Drew” Maza, 31, was another arrested, charged and sentenced for his role. Hines said that himself and Maza were the two behind the operation and took turns ordering anabolic steroids from China. Using the money transfer service Wester Union, funds were sent to China and raw products were then imported into the U.S. and then manufactured into finished products ready for injection or ingested. Maza aditted to using his employers printer for labeling their steroid products which they named – LA Labs. According to LA Labs’ website, the company produced high quality health, beauty and steroid products and had a large network of distributers and affiliates in the Unites States. What this ‘company’ really was was a simple UGL providing steroid to bodybuilders and recreational drug users. Hines has now completed his sentence on charges relating to the sale of anabolic steroids including: delivery of a controlled substance, possession of a controlled Schedule III substance with intent to deliver, manufacturing of a controlled substance, maintaining a drug premises, and simultaneous possession of drugs and firearms. As well as completing his 3-year jail term, Hines has also passed all drugs tests and paid all court fines. Hines’ attorney, David Price, made a motion to withdraw the plea of guilty. Circuit Court Judge David Talley then agreed this and Hines guilty plea was removed. Three years jail seems fairly lenient compared to other sentences we’ve seen and reported here at Steroidal.com.